Once practised only by the upper class in England, afternoon tea has now become a popular trend that can be enjoyed by anyone. 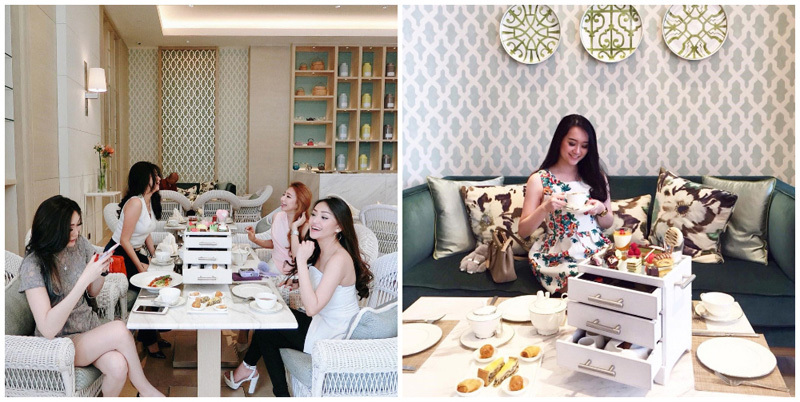 Imagine — relaxing in the afternoon with a cup of soothing tea — and be spoiled with bountiful choices of delectable snacks. Sounds pre-tea good to us! 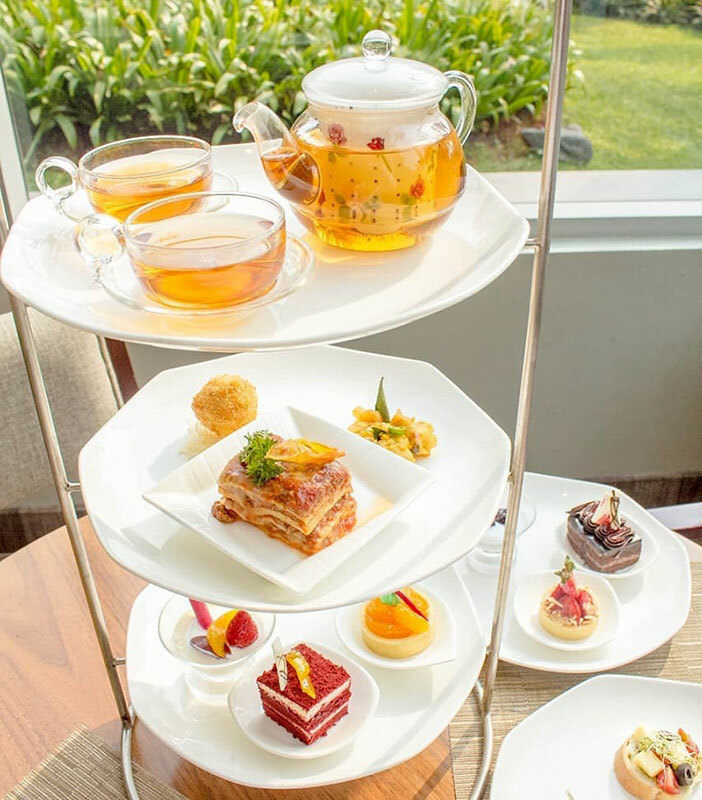 Thankfully, Jakarta offers a plethora of afternoon tea places that are unique in their own ways, from European-inspired menus to very special Indonesian snacks that are neatly wrapped in luxurious wrappers. 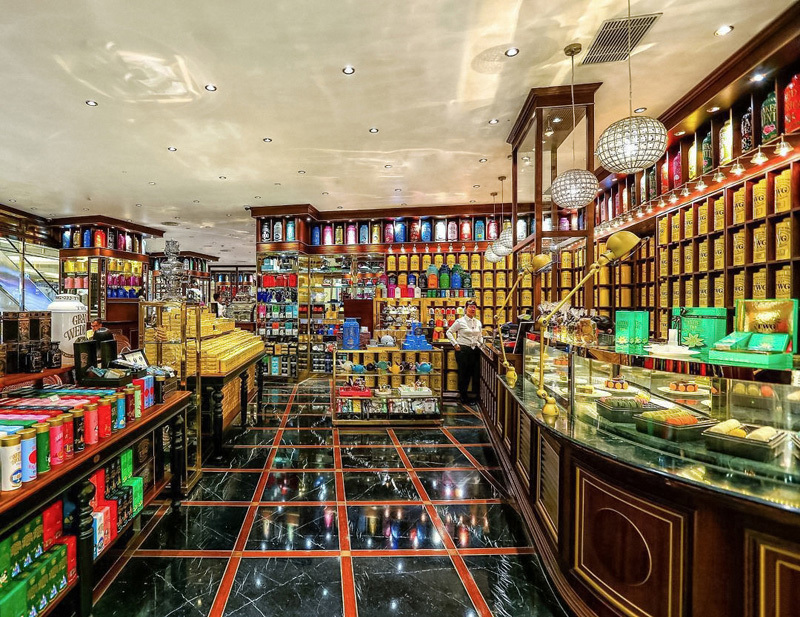 You can find any of your favourite teas right there. Perhaps you’d like coffee instead? Or natural herbs that are rich in health benefits. 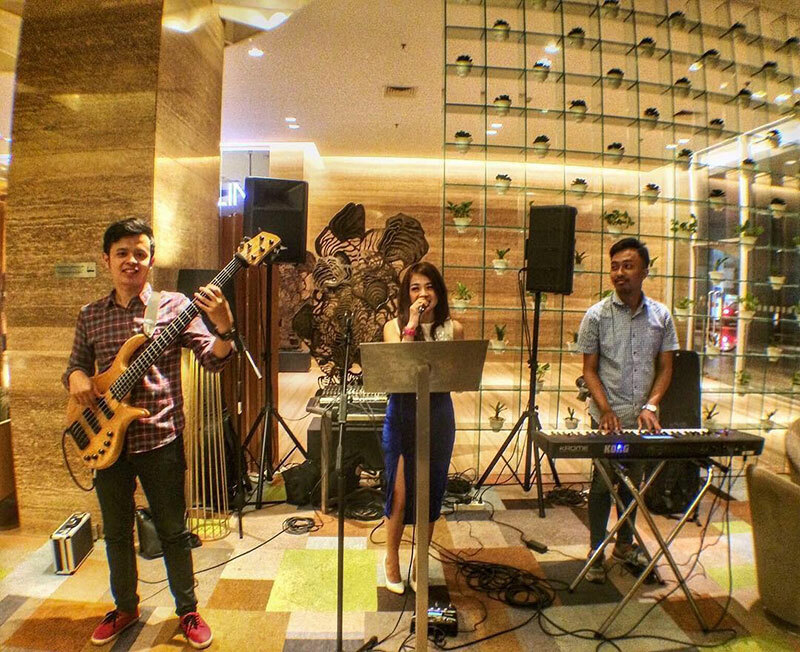 One thing’s for sure: you won’t have to worry about where to spend your afternoons in Jakarta. So, keep calm and take a sip! 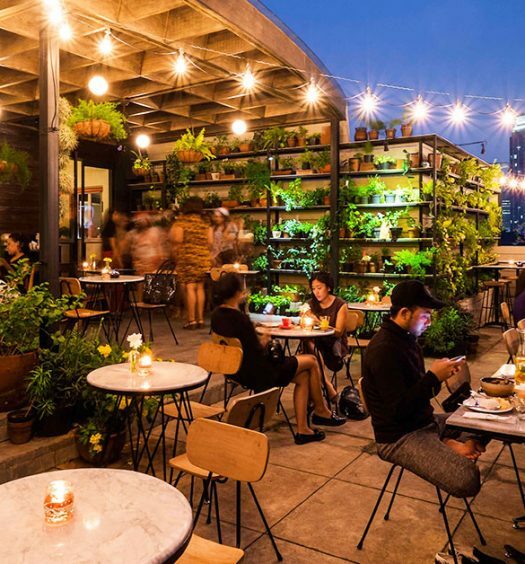 15 Romantic garden restaurants in Jakarta with affordable outdoor fine dining for your special date! 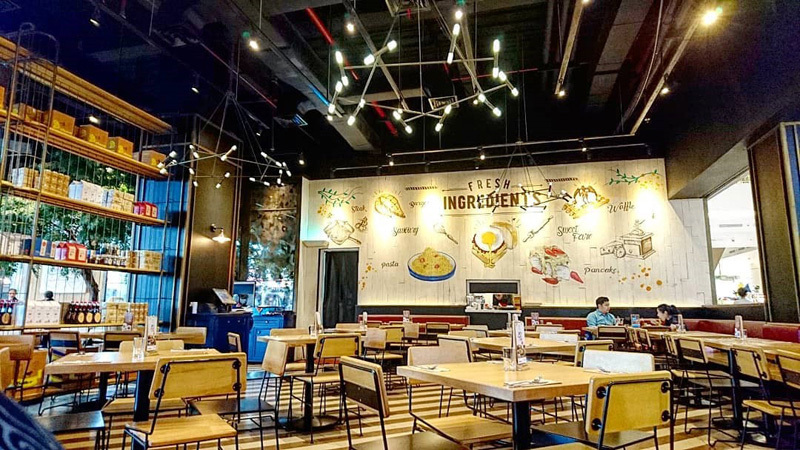 Relax and enjoy the afternoon sunlight bouncing off the cream and white walls, while you indulge in a feast that’s just too pretty on the eyes. 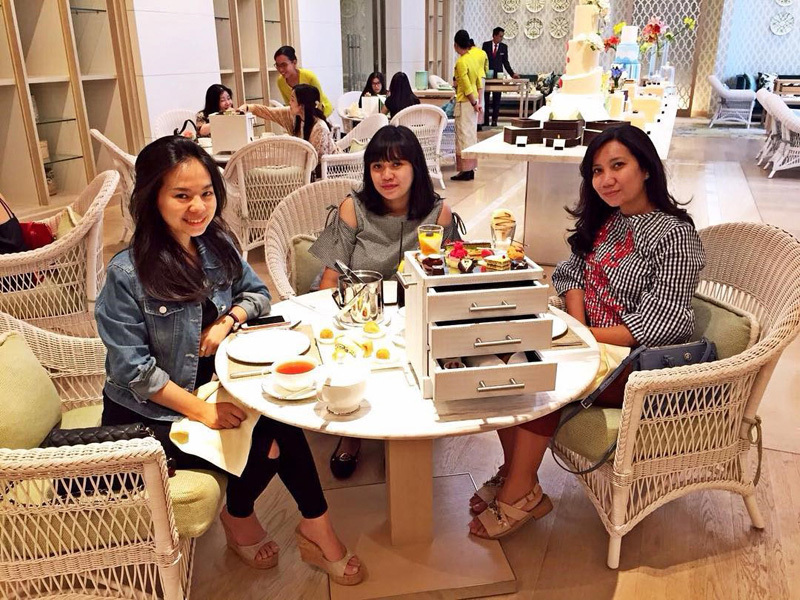 What’s so special about this high tea is the handcrafted leather treasure / jewellery box, with pull-out drawers filled with gorgeous and elegant cakes, pastries and finger foods. 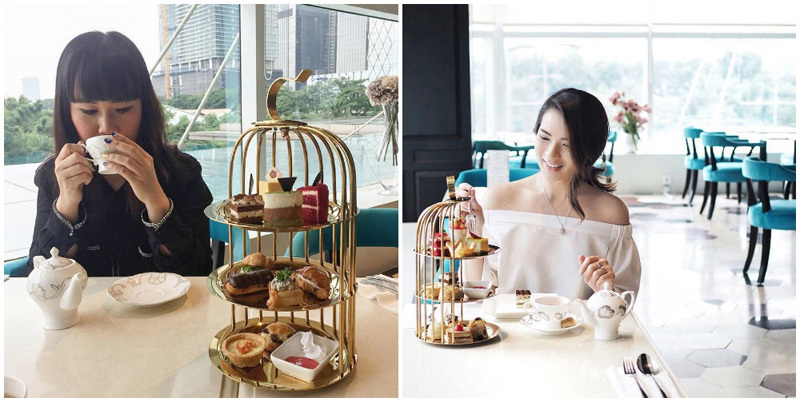 It’s a different take instead of your usual 3-tiered afternoon tea stand, and is really intriguing to the eye (and tummy!). A must mention is their top-notch service, so you can prepare yourself to be treated like the Queen of England, if only for an afternoon. Don’t forget to stick out your pinky, take out your napkin and do a curtsy. Nahh, we’re just kidding, we’re not in Old England are we now? Although it sure does seem like it. This is classic British afternoon high tea. 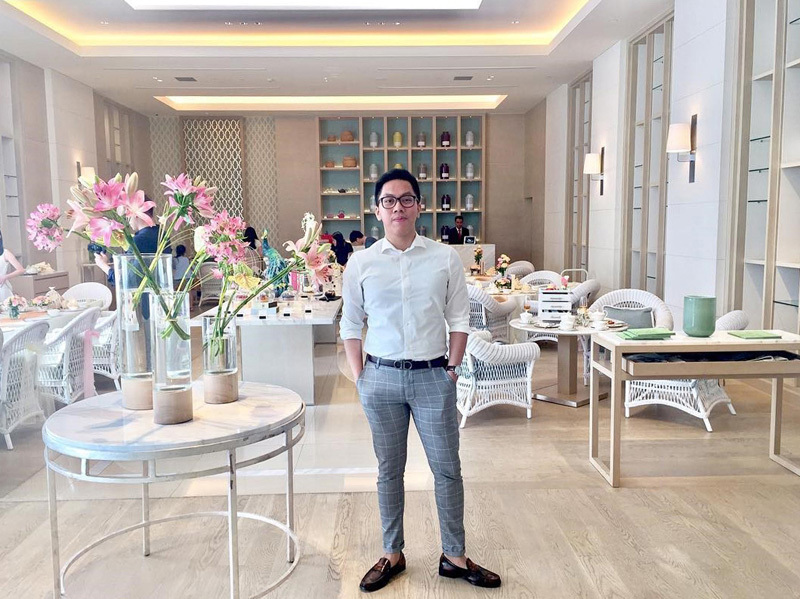 You’ll enjoy the homemade scones, layered cucumber and salmon sandwiches, macarons, mille-feuille layered pastries and tempered chocolate spheres. What we ABSOLUTELY love about this place though, is the outdoor seating. Designed in wooden circular structures with rockpool running through – fresh air and a natural ambiance are certainly guaranteed! Although it’s a classical afternoon tea, there’s a real contemporary feel about it. It’s the perfect place to unwind and relax, and maybe even take a few snaps! 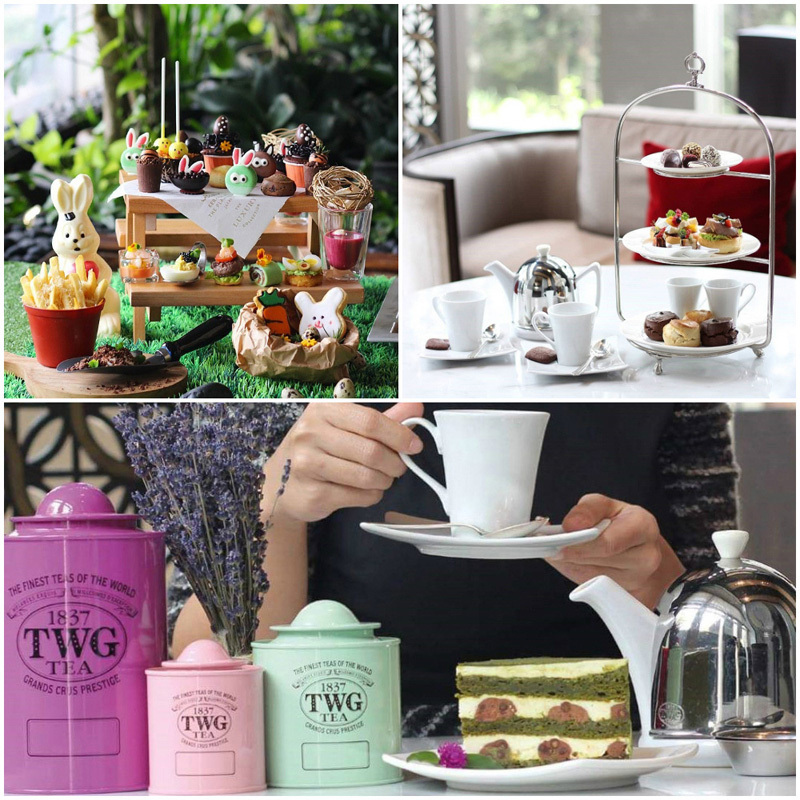 Inspired by Alice in Wonderland’s tea party (except that it’s not literally mad as portrayed in the book), Lewis & Carroll takes you on a journey to Alice’s magical world of tea parties. 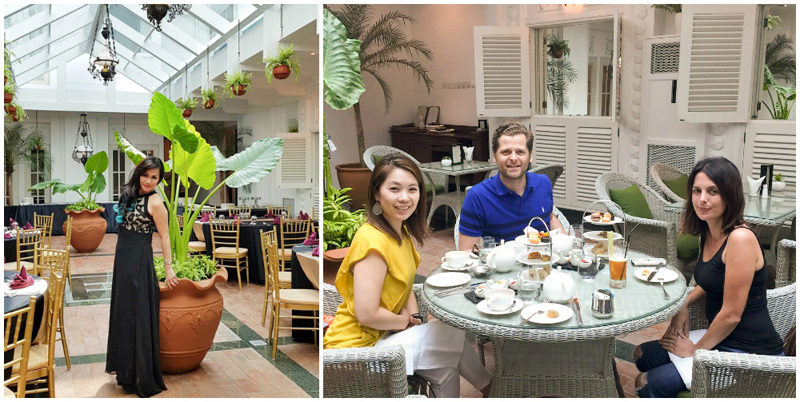 From elegant tables to large windows, embrace its magical beauty under natural lighting, surrounded by walls full of beautiful potted plants. A lovely setting that creates Instagram-worthy photos worth remembering. Slowly, you’ll learn that its true magic lies in its tea! Here you’ll find teas from Indonesia, China, Korea and Germany. What’s even more unique? 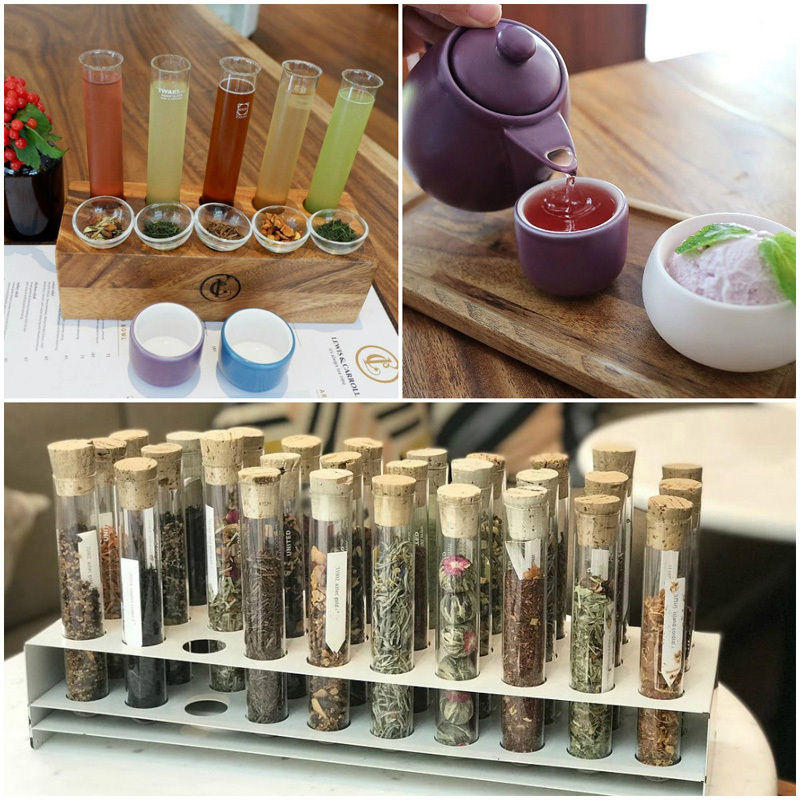 You can explore their choices of tea from test tubes. After checking out the different tea aromas, you’ll surely be able to find the right tea to suit your liking! 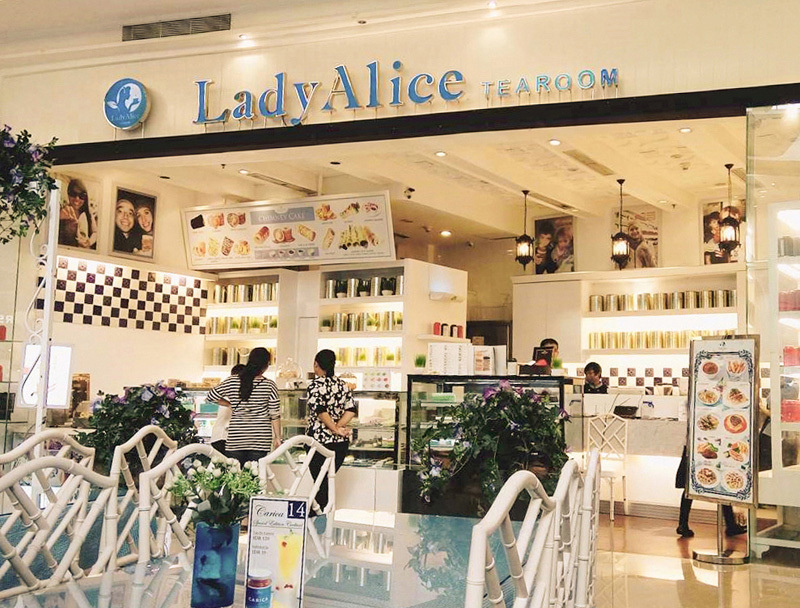 You’ll always have something to munch on, as there are all kinds of sandwiches and cakes served to accompany your tea. And you’ll never run out of hot tea! For serious tea drinkers, there are also tea equipment and tea leaves sold here, so you can drink tea from the comfort of your own home. Think back to the golden era, where life was all about the arts and history of time. 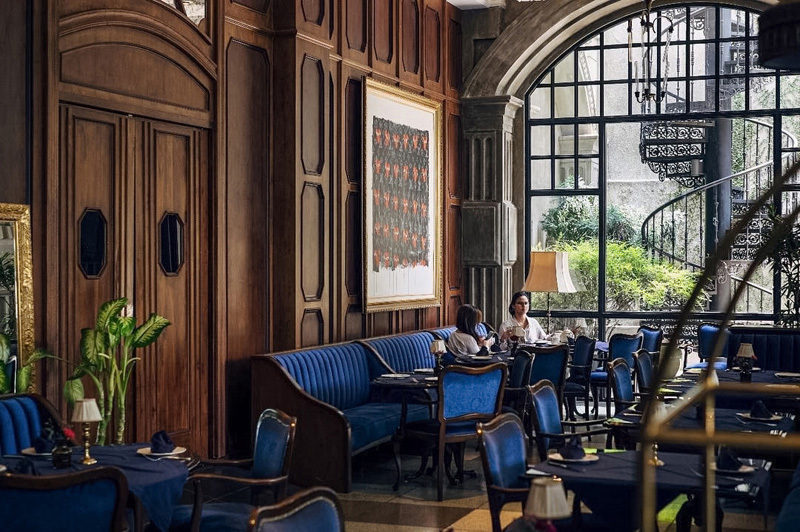 With its old-world charm and luxury (the kind where writers met in bars and sipped tea in the sun all day) – Writers Bar is beautifully decorated and has the ability to transport you back in time. It’s all very English, serving scones with mascarpone cheese and homemade jam, as well as florentines and blueberry frangipane and lemon tarts – just to name a few sweet treats. Pastries and savouries are beautifully presented, and the detail in their plating is a celebration! On that note, celebrating all things magical, there’re special features all around including falling crystals from the ceiling to portray enchanting rainfall, and golden fish swimming brightly on the carpets. 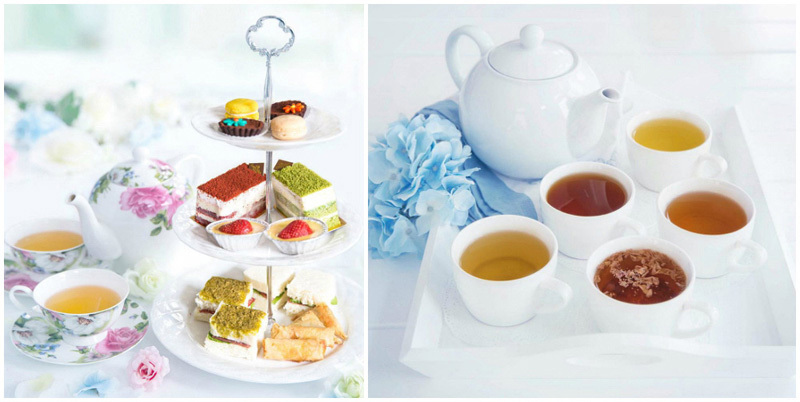 Indeed, high tea doesn’t always have to come together with European-style snacks. 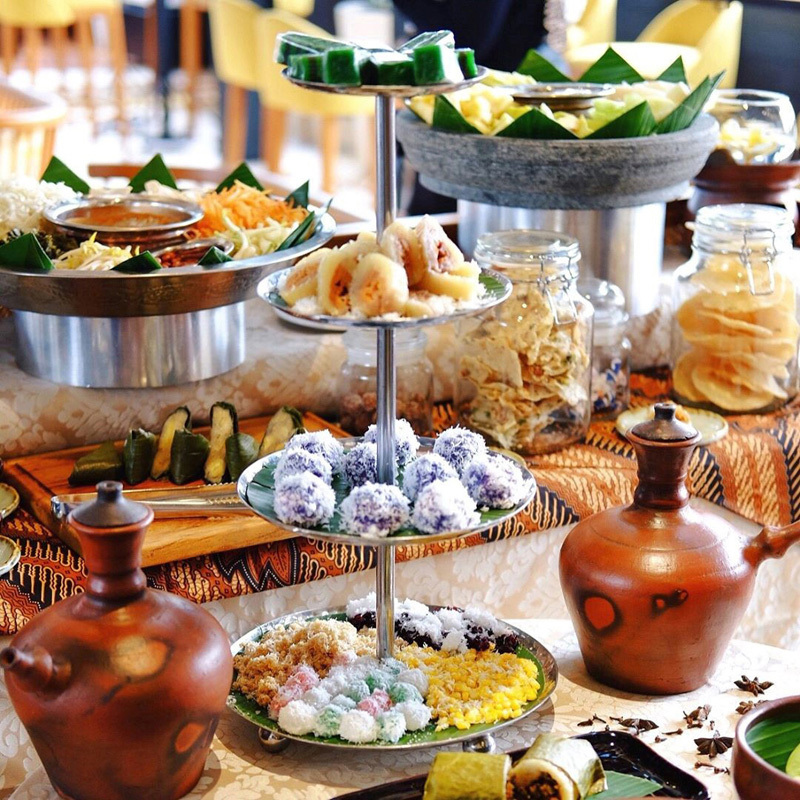 Authentic Indonesian food also makes a wonderful companion for your afternoon tea. Plan a visit to Kila-kila by Akasya now to experience it yourself. 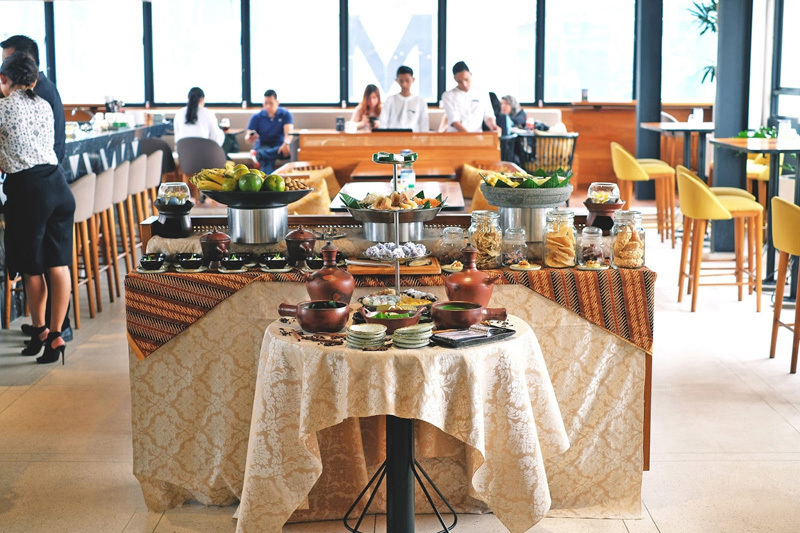 Plus, there’s a variety of Indonesian specialties served for you to enjoy as much as you’ll like. Basically, this place offers a high tea buffet! 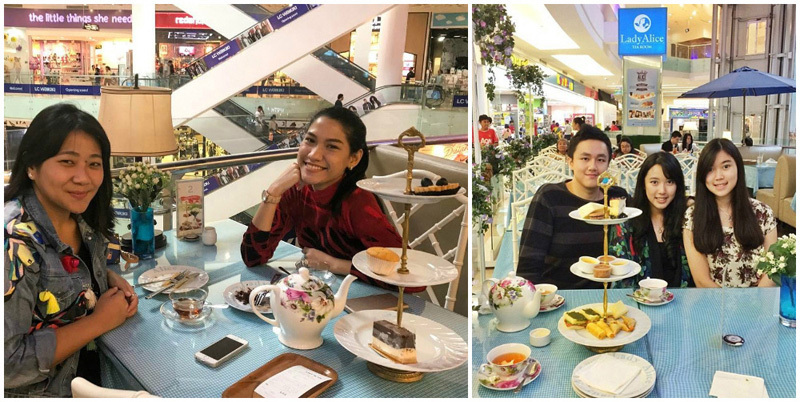 Not only will you find fresh natural tea from Indonesia, you’ll also get to try Indonesian-style herbal high tea drinks! These herbs come in all kinds: turmeric acid, brotowali and kencur rice. They are of course, fresh and healthy! Don’t forget to try their mouth-watering traditional Indonesian food. 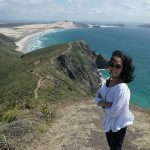 Apart from local dishes, there are also delicious side dishes for you to snack on such as fried foods, rujak, pastries, pancakes and onde-onde. The types of cakes served are always different, and regular customers with a sweet tooth always find it tempting to come back. Their paper wheel decorations give a unique touch to their already attractive setting. 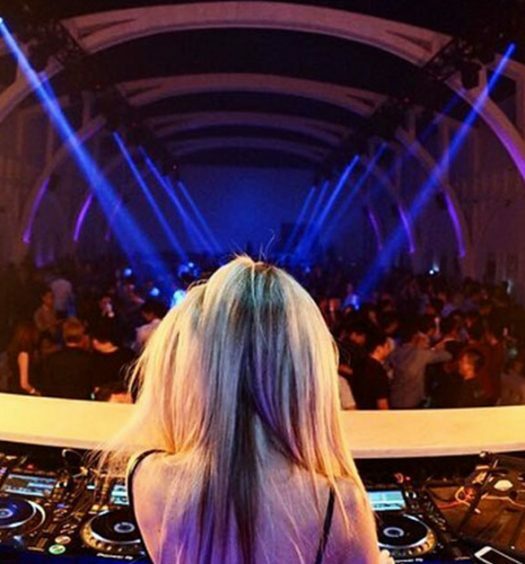 Soft music is also played to add to the lovely ambiance. 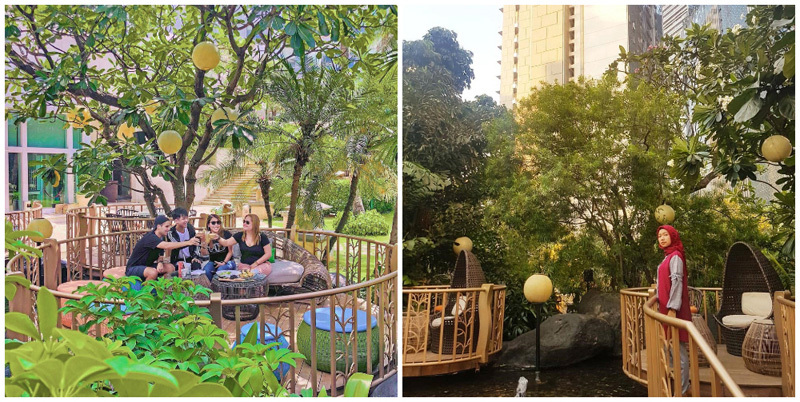 Fun fact: In Sanskrit, the word ‘Kila Kila’ means “the sound of happiness”, which is what this high tea spot has to offer each time you come for a visit. 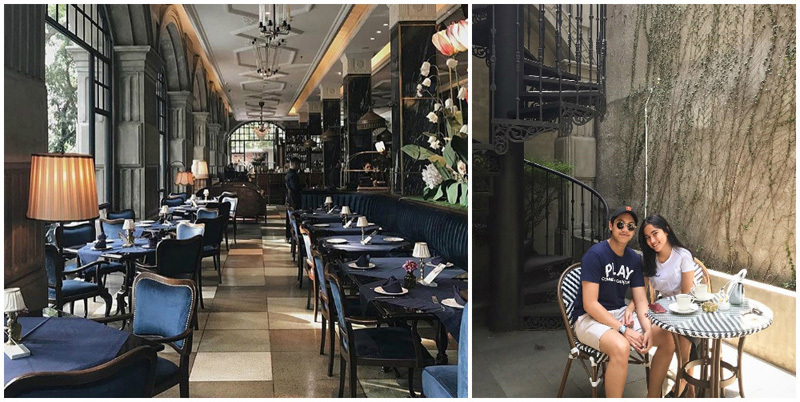 Located on Jalan Gunawarman, this elegant teahouse is the talk of the town thanks to its unique, classic European-style architecture. Somehow it looks like Hogwarts, the school of the famous fictional character, Harry Potter. 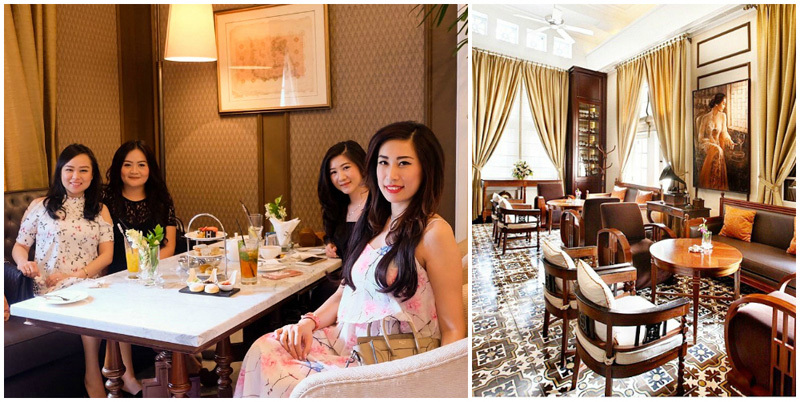 This gorgeous teahouse is where you’ll find scrumptious desserts that will complement your afternoon tea experience. Or perhaps you’re more interested in coffee and herbal drinks? 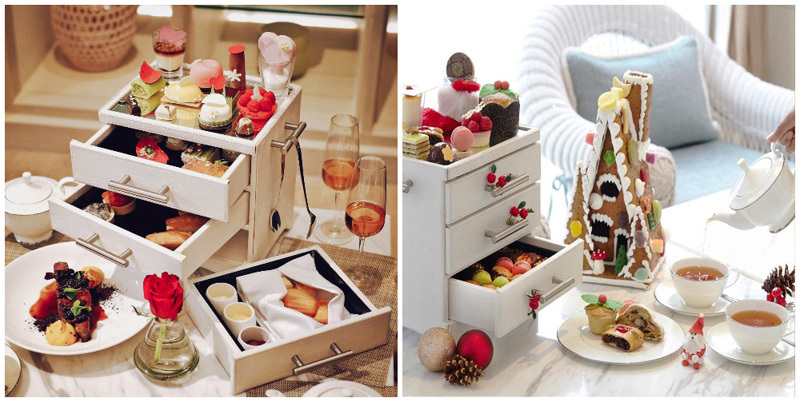 To accompany your tea, there’s an array of luscious snacks – nicely arranged on 3-tier serving trays for you to enjoy – such as cheesecakes, s’mores, macarons, and doughnuts. Since every one of them has been tweaked to suit Indonesian palates, don’t be surprised if you happen to taste palm sugar when tasting any of these sweet treats! 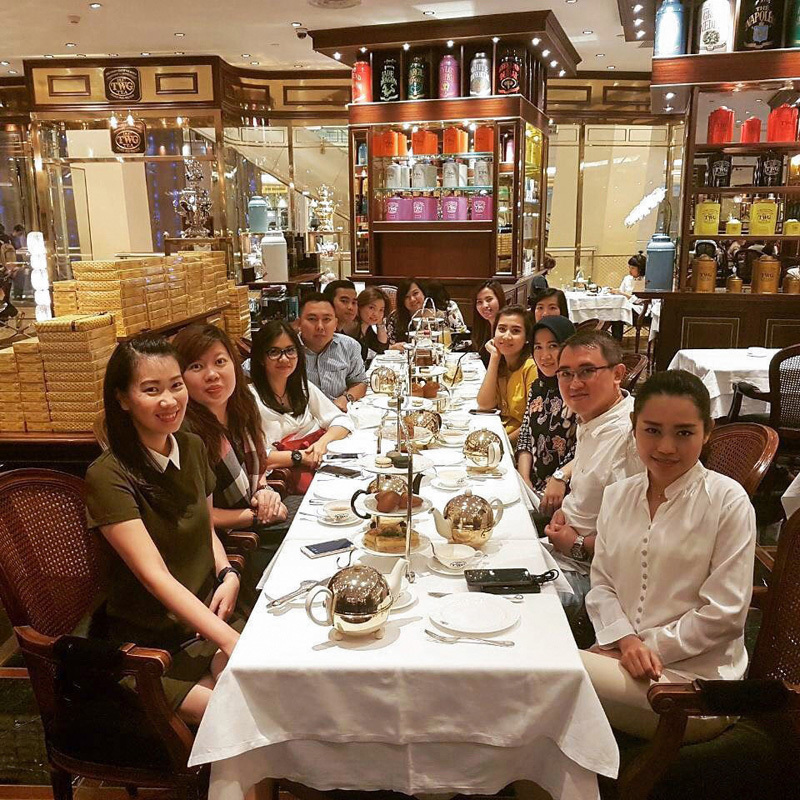 Every month, their food maestro makes new creations for their high tea menu. So no matter how often you visit this place, you won’t get bored of what they have to offer. The original building was built in 1923, and still stands beautiful and strong. 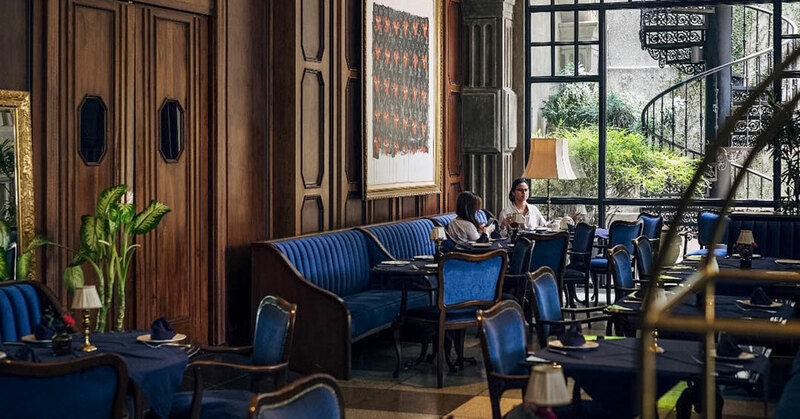 Naturally, this colonial-styled bistro has all the finishes that scream classic, and there’s a real elegance and richness about it. 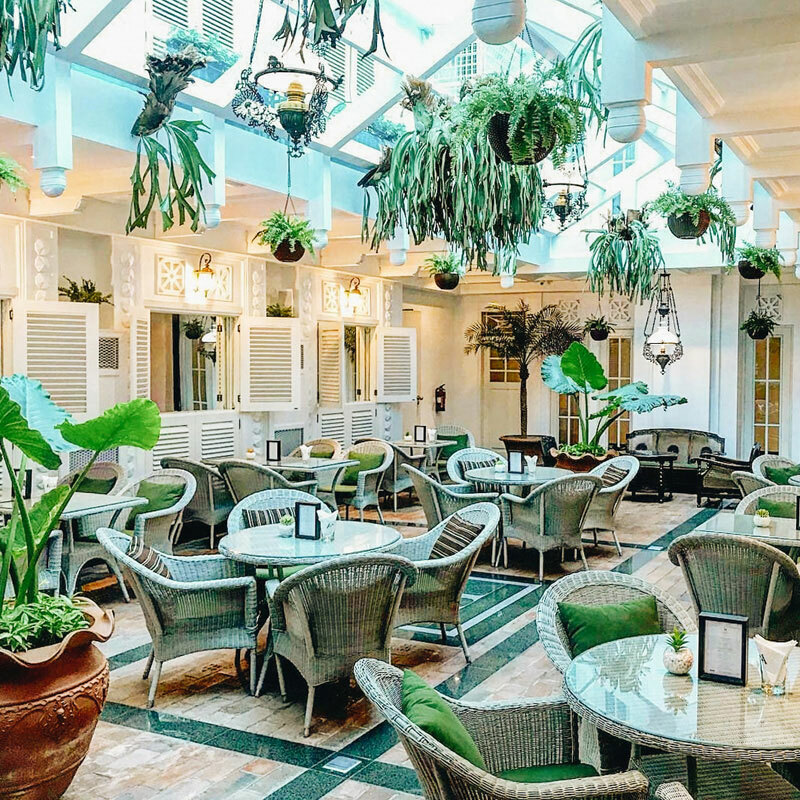 The architecture allows a room full with natural light, and tables are surrounded with plants also hanging everywhere – because who doesn’t love some green ferns? 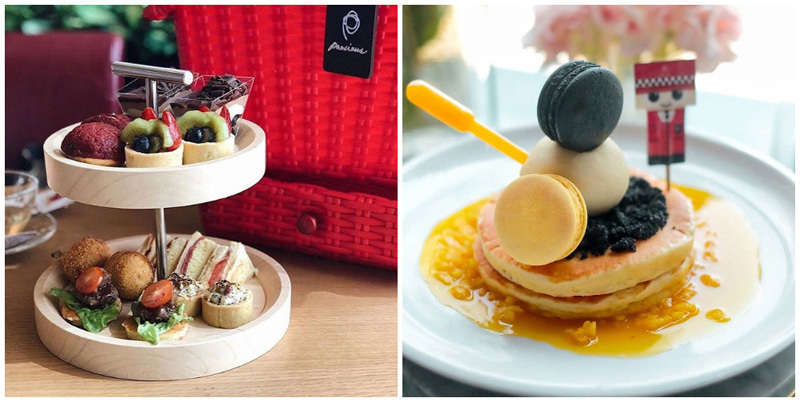 You can expect to find classical pastries from chocolate eclairs to strawberry macarons. 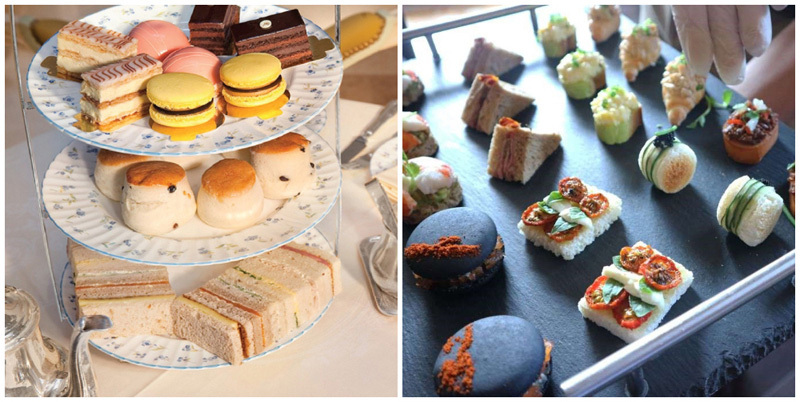 There’re also two options for your afternoon tea set, ‘Western’ snacks or Indonesian snacks, so they truly cater for all taste-buds! Pancious is a cute little place serving up pancakes, but we all know there’s so much more to a pancake than the ones you eat on Sunday mornings. 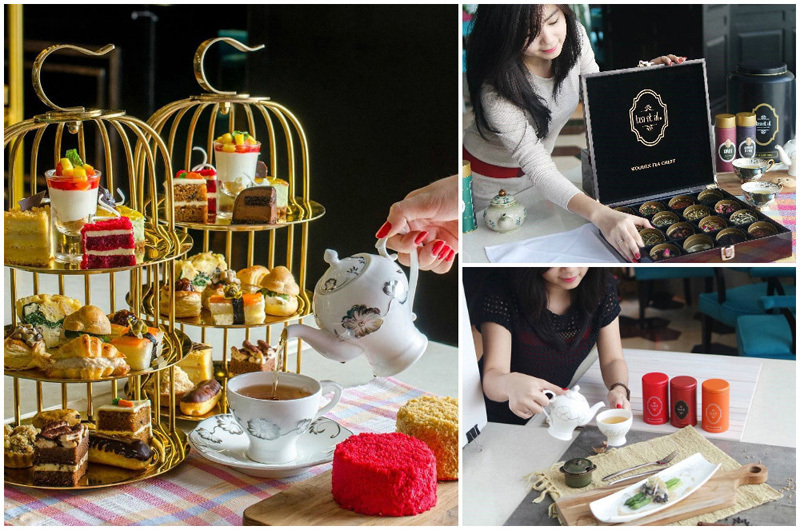 Apart from pancakes, there’re also tons more delicious high tea delights in a set for you to try! Their presentation is very unique here, using bamboo ‘steaming’ baskets which are filled with various fresh fruits, pastries, sweet treats, and of course, savoury ones too. 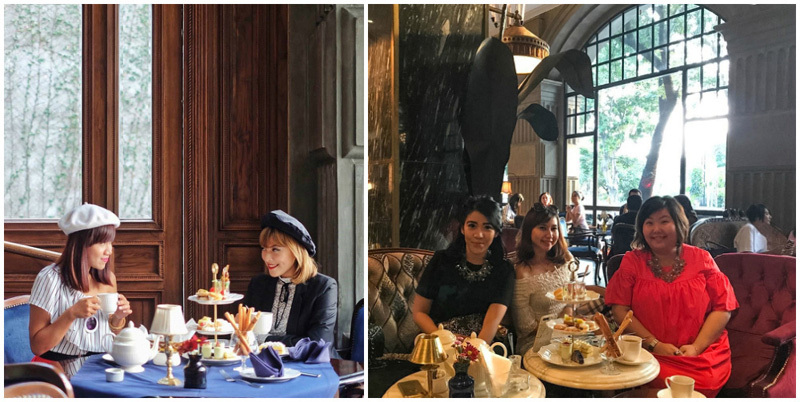 Their high tea basket includes: fruit tart, chocolate tart, strawberry panna cotta, smoked salmon and chicken liver blinis, smoked beef & cheese pancake triangles, sandwiches, risotto cheese balls and a cup of Twinings – english breakfast or jasmine tea – phew! Beautifully arranged cakes and pastries – of different colours and irresistible flavours – served on 3-tier serving trays – now who could resist them? For main offerings, such as scones with cream or raisins, look at the top level of the serving trays. The second level is usually occupied by a variety of sandwiches. For sweet appetisers, look at the lowest level. 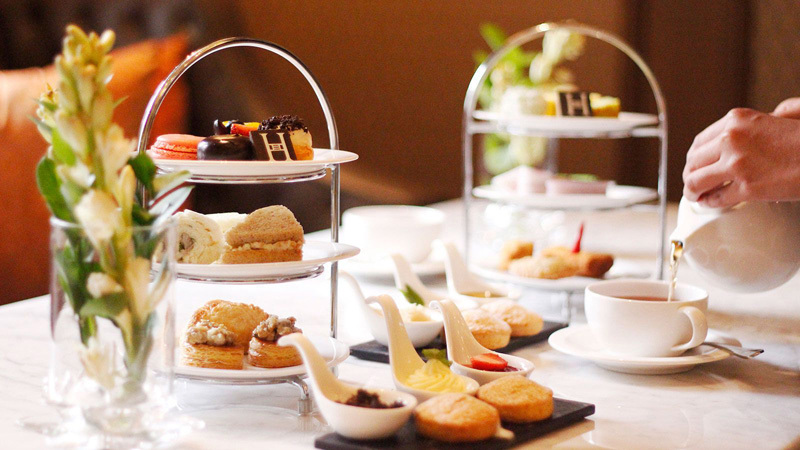 All dishes are accompanied by a cup of British Indian High Tea that will complete your afternoon. Please note that the high tea menu is always changing. 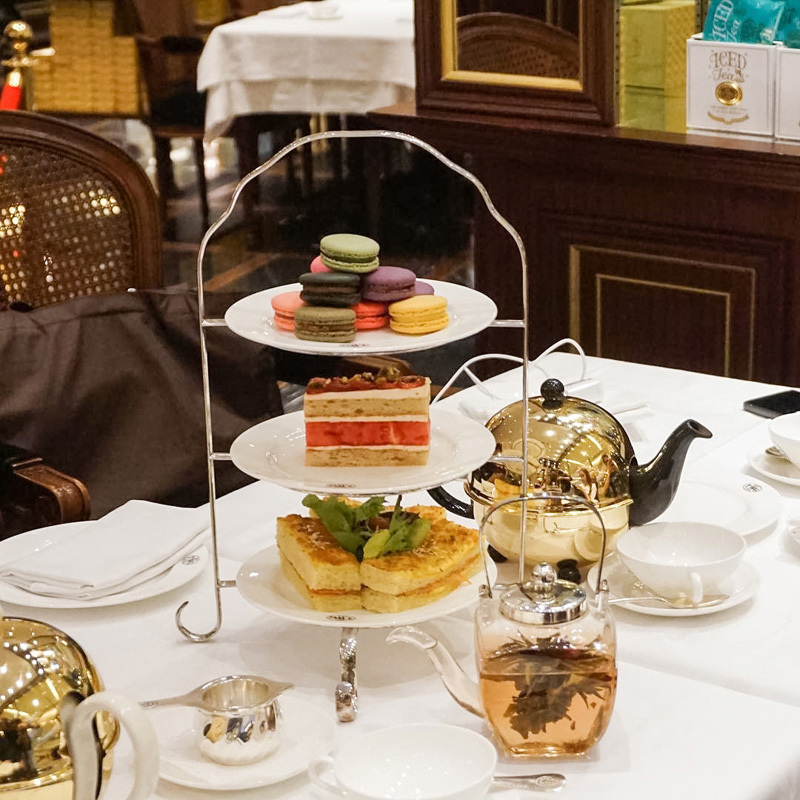 For example, their Vienna high tea offers a variety of Vienna specialties, while their British-Indian servings come with a twist of Indian flavours – such as samosas in classic English dishes, or sweet strawberry desserts! This is why visitors love them so much and would always come back for more. Regardless of their ever-changing menu, the quality of their hospitality and lovely atmosphere remains top-notch. You might think you’ve seen enough of North Jakarta’s beauty as you enjoy the beauty of Ancol in the afternoon. But to truly enjoy its ‘sweetness’, you’ll need to be at the right place. 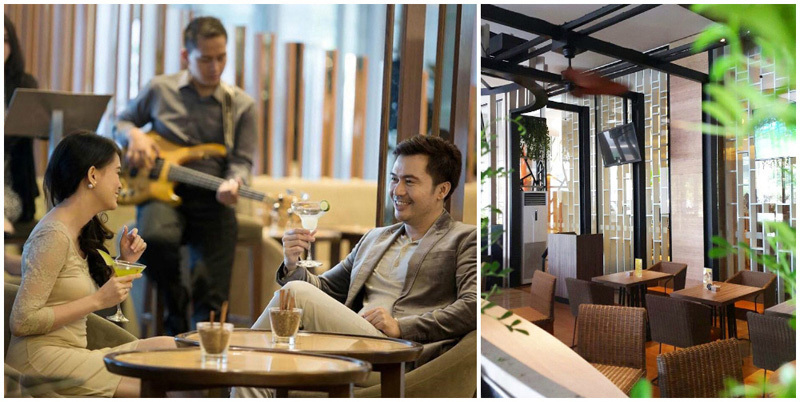 Located at Holiday Inn, the Habitat Lounge is where you can enjoy the beauty of the afternoon sun in North Jakarta. While you’re at it, enjoy their warm hospitality and indulge in their special dish – scones served with jam and thick cream. Wait! There’s more. There are croissants, éclairs, puddings, cheesecakes, tiramisu, and various kinds of tarts to more than satisfy your sweet tooth. Complete your afternoon with any tea of your choice: english breakfast, earl grey, chamomile, jasmine tea or green tea. 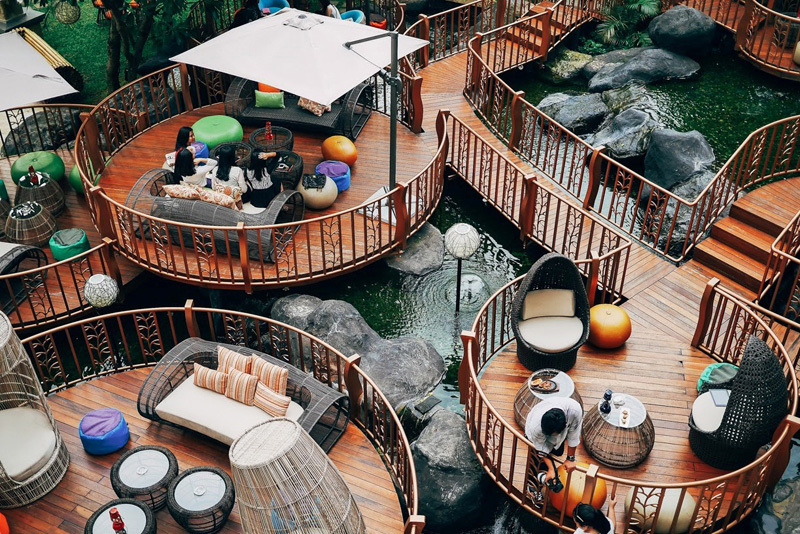 Who would’ve thought that right at the famous HI Roundabout, the iconic heart of Jakarta City… One could enjoy the calmness of traditional nuances, with a glass of tea accompanied by interesting and delicious snacks. 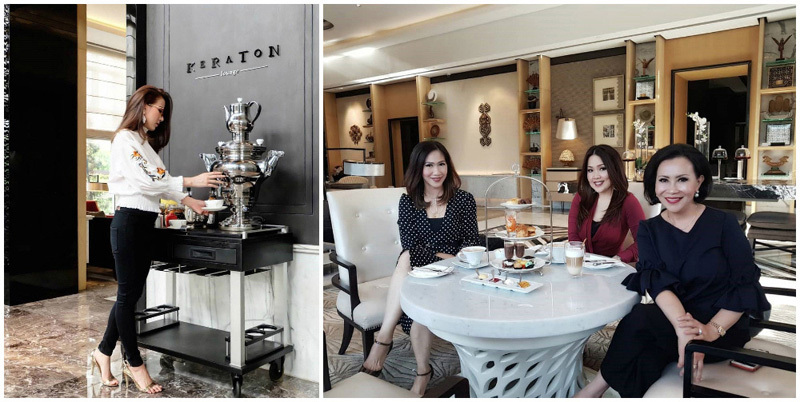 At Keraton Lounge, tea will be your perfect afternoon companion, from the best quality tea to the most authentic Indonesian tea. What’s even more interesting? 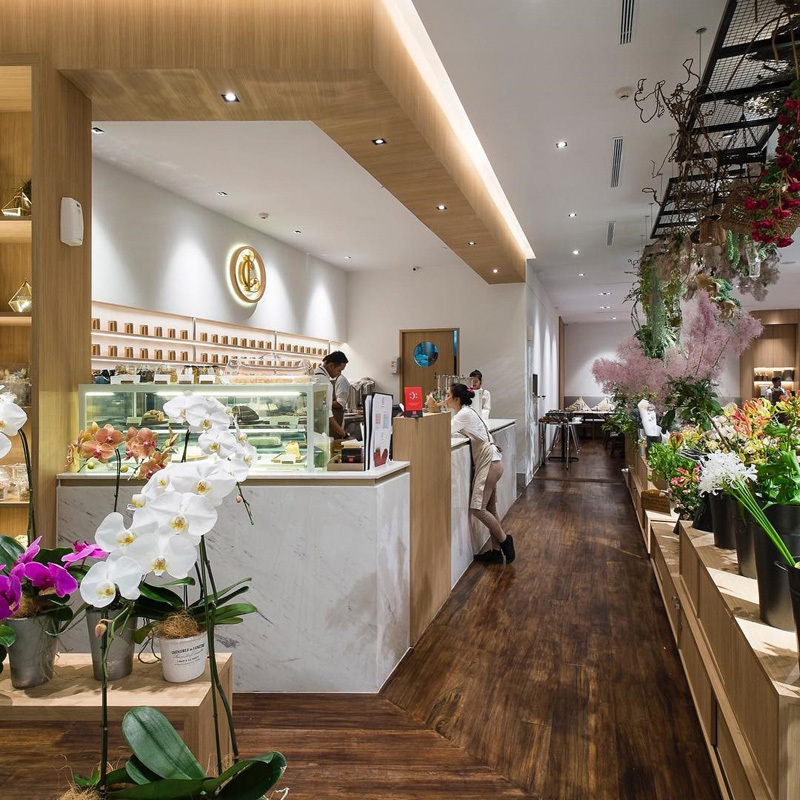 This is the only place where you can enjoy a variety of food based on GODIVA luxury chocolates – whose name alone guarantees you sweet indulgence and pleasure. Warning: Thanks to their skillful patissier, their food appears to be too beautiful to be eaten! 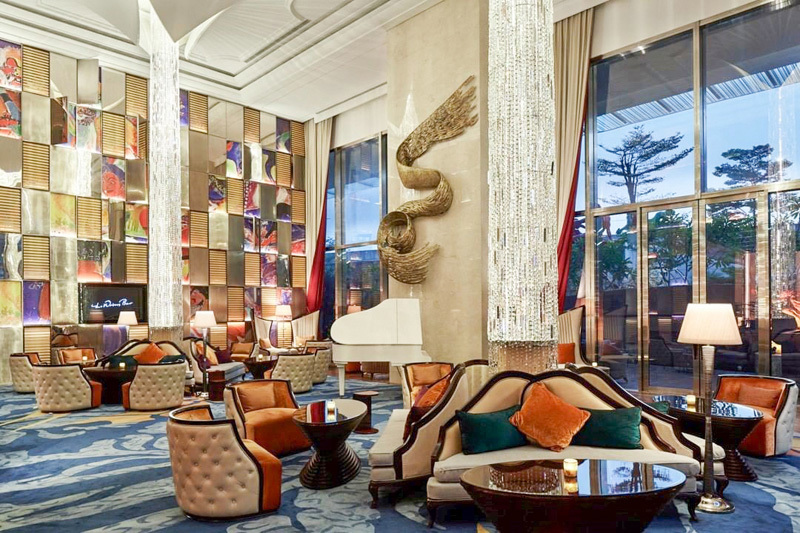 This lounge may be located at the center of Jakarta, but its traditional and home-style atmosphere will undoubtedly make you feel at home. This is a special place for you to enjoy your afternoon. 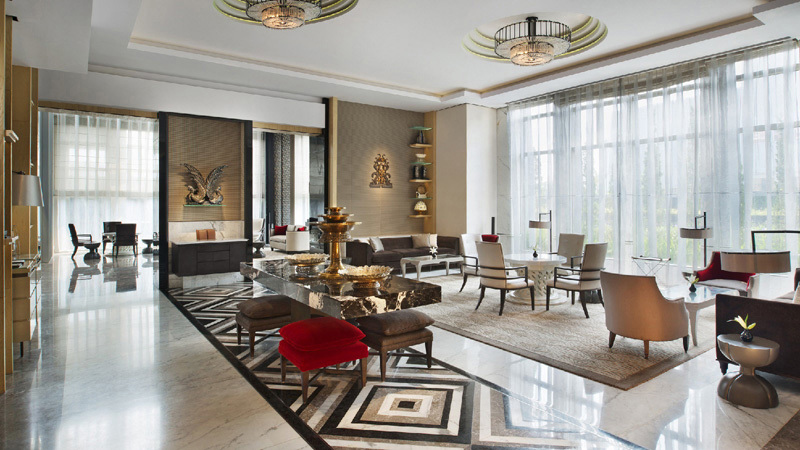 Its bright gold interiors are eye-catching and extra indulgent, a special characteristic of TWG. Sitting nicely on shelves for you to keep an eagle eye on, is a variety of some of the best tea that the store has to offer – 500 types of tea, they say! Whatever your favourite tea is, you’ll find something to suit your taste. Warm atmosphere and hospitality combined with delicious tea. Sounds tea-riffic to us! But the best thing is their alluring afternoon tea set. Enjoy your favourite tea, but don’t forget to indulge in the sweetness of the fresh scones and muffins. 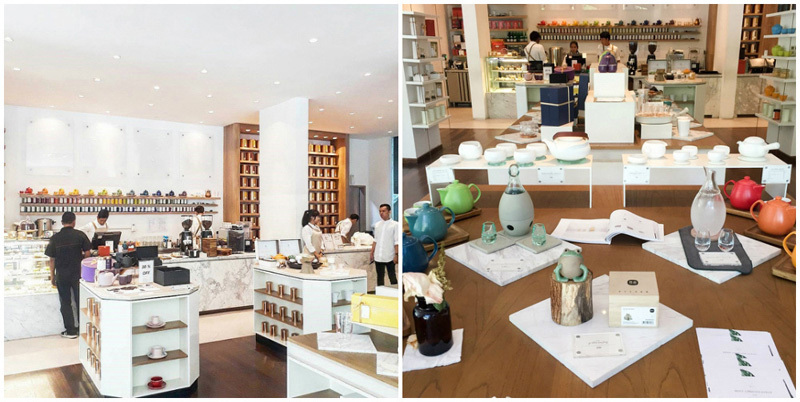 This is also where you’ll find enticing macarons and colourful pastries. To get people to embrace their love for tea in the comfort of their own home, there are all types of tea ready for sale here. So feel free to take one home! Fun fact: TWG is the abbreviation for ‘The Wellbeing Group’. 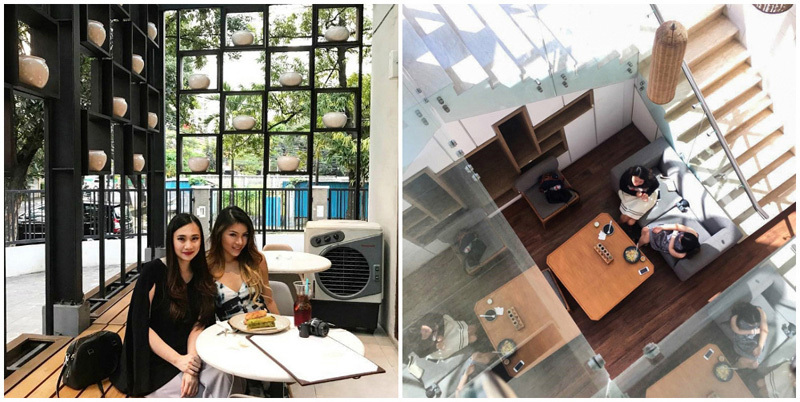 If the saying ‘Shopping is my cardio’ applies to you, there’s no better activity than to visit this cosy café and sip on freshly brewed tea. One of the best ways to help you relax and recharge after you’re done ‘exercising’. So where’s the right place to do it? 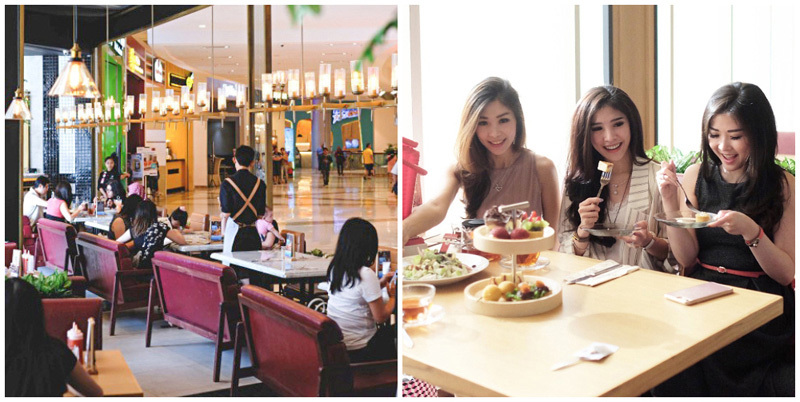 This trendy and comfortable café in Galeries Lafayette should be top on your list – and it’s located at Pacific Place, a shopping paradise. 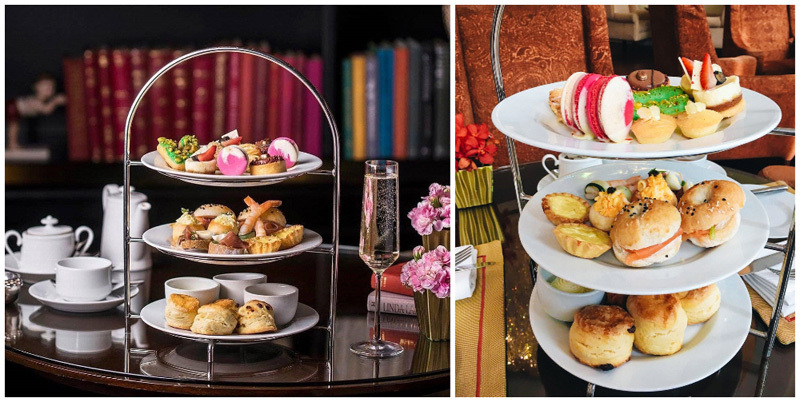 Afterwards, enjoy a fancy afternoon tea accompanied by an array of attractive pastries – such as scones, sandwiches, snacks and puddings that are neatly arranged on tiered serving trays. Of course, nothing is complete without tea. 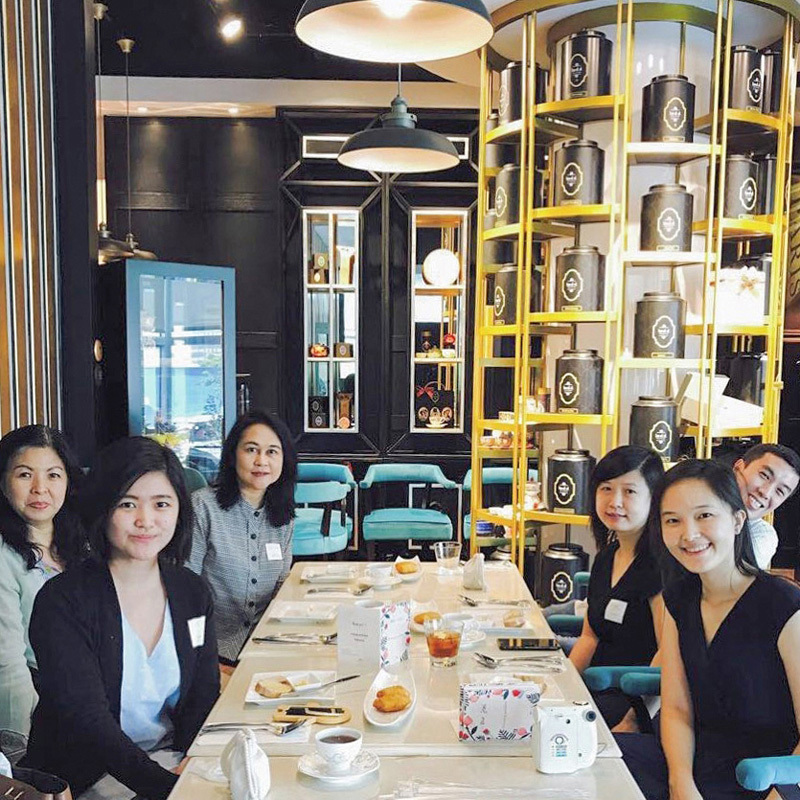 Luckily, there are all kinds of tea served here, from black tea, green tea, oolong tea, to pu-er tea from all around the world. Feel free to make your choices! 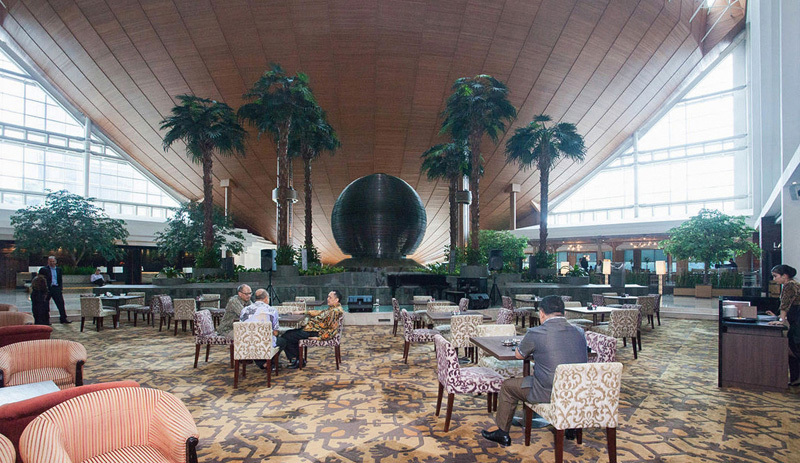 From here, you’ll enjoy a view of Jakarta’s business centre as you indulge in a well-deserved afternoon tea treat. Take a peek at the variety of gift sets including tea leaves or tea-drinking equipment that you can choose as gifts for others, or for yourself. When you and your friends step into this place, you might feel like nobility. The tables are covered with white and blue tablecloths, and flowers are used as table decorations. 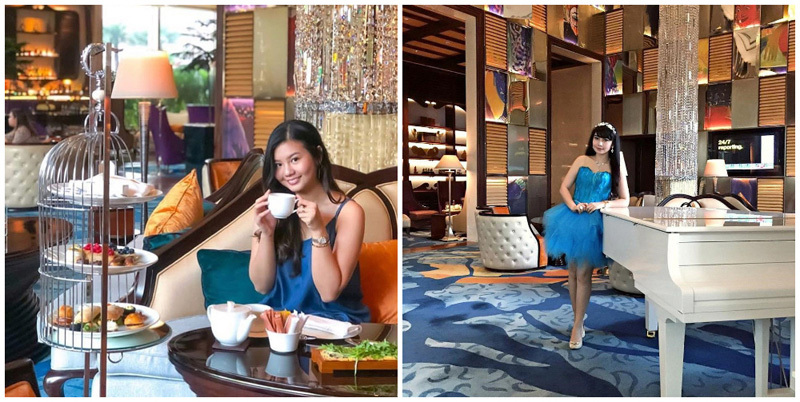 Looking at its decor, we wonder if it’s also meant for welcoming Alice, the little girl from Lewis Caroll’s Alice in Wonderland. There’s no need to get all panicky, for there won’t be any riddle for you to answer. Hold on a sec! Perhaps you’ll need to answer one question, though. What tea would you like to have? The choice is yours. It turns out that apart from its unique interior, the tea served here also has its own quirks. Just look at their names: Fruit de la Passion Tea, Hibiscus Vanilla Tea Rose, Honey Spiced Tea and Lemon Hibiscus Tea. One thing’s for sure, they’ll taste good with any dessert you choose! 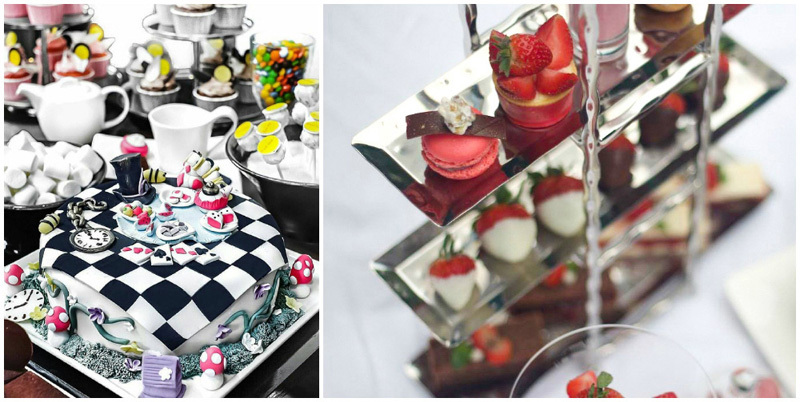 All desserts are nicely displayed on 3-tier serving trays, starting from sandwiches, to cakes, scones and chimney cakes. The servings are ever-changing, so something new awaits you each time you come for a visit. Even better, you can enjoy their menu throughout the day. Interested? Plan your visit now! 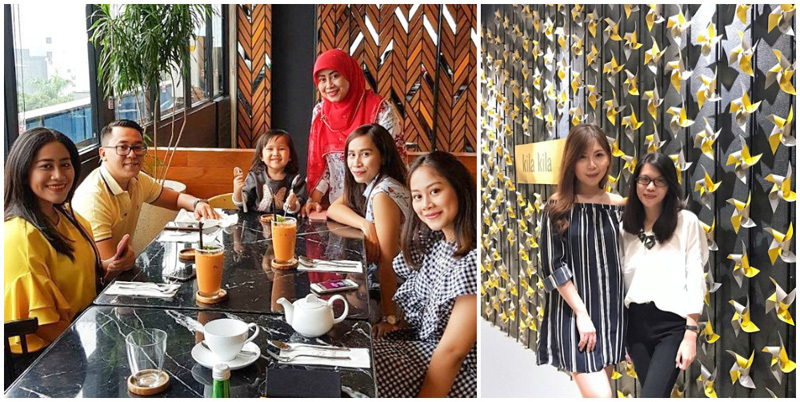 Instead of worrying about getting out of Jakarta’s crazy traffic jams, why not spend your afternoon at any of these lovely tea places? The best way to relax, at least until the traffic jams slowly settle down. In the meantime, keep calm and drink tea! 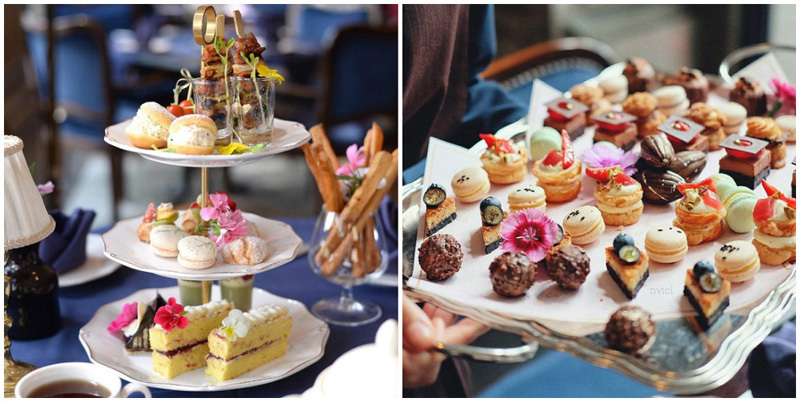 So which one of these afternoon tea places is your favourite? Let us know in the comments below!